Mike and I took my sister and her husband to Napa for a weekend before they moved from the Bay Area to Hawaii. 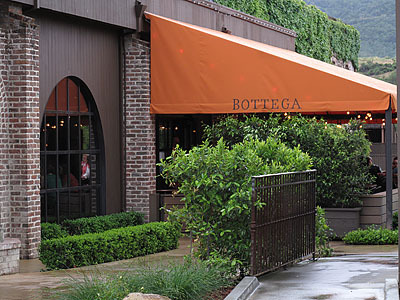 We decided we would dine at Bottega, Michael Chiarello’s newest creation. On the night we arrived he was actually in the house. While waiting for our table he walked through the bar and mingled with guests. As he was making his way back to the kitchen he made a comment to my sister and brother-in-law. The waiting area is small and the place was packed so my sister was sitting on her husband’s lap. Chef Chiarello said something like “You guys look comfortable… I’m gonna bring you a menu, actually maybe just dessert.” (at lease that’s what I think I heard — it was noisy so I could be a little off but that was the jist). Soon after we were seated at a large round table in the side dining area. We started our meal with a raw fish appetizer and fresh mozzarella. For mains, I chose the seafood stew, Mike had the Quail and my sister and hubby shared a giant porterhouse steak and fries. For dessert we had a yummy cookie plate and a tart. 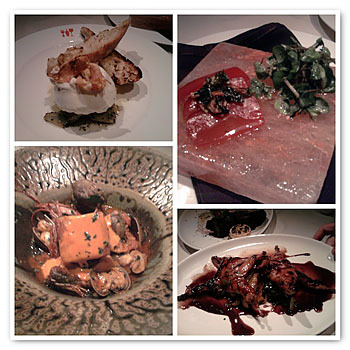 The food and service was very good definitely worthy of a Top Chef Master but we didn’t expect anything less. 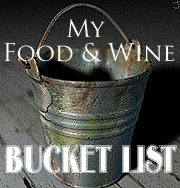 For years Mike & I have been fans of the NapaStyle empire Chiarello created. If you haven’t heard about his wine club check it out. We have been members for over 2 years and we love it. Note: This dinner occurred in May 2009. Nice course! Looks tasty and yummy!